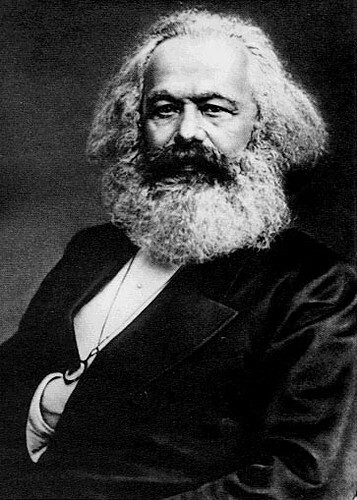 Karl Heinrich Marx was a German political philosopher who wrote about economics and politics. His ideas played a significant role in the development of modern communism. Marx argued that capitalism, like previous socioeconomic systems, would inevitably produce internal tensions which would lead to its destruction. Just as capitalism replaced feudalism, he believed socialism would, in its turn, replace capitalism, and lead to a stateless, classless society called pure communism. Karl Marx thought that religion was an illusion, with no real God or supernatural reality standing in the background. Religion was a force that stopped human societies from changing. Marx believed that religion was a social institution, and reflected and sustained the particular society in which it flourished. He went further. Religion was a tool used by the capitalists to keep the working-class under control. Religion provided the working-class with comfort in their miserable oppressed circumstances, and by focussing attention on the joys to come after death, it distracted the workers from trying to make this life better. Furthermore, it took the noblest human ideals and gave them to a non-existent God, thus cheating human beings of realising their own greatness and potential. Marx argued that the illusory happiness provided by religion should be eliminated by putting right the economic conditions that caused people to need this illusion to make their lives bearable. Religion was like a pain-killer (hence Marx’s famous reference to it as “the opium of the people”), but what was needed was to cure the sickness, not sedate the patient. Religion is the sigh of the oppressed creature, the feelings of a heartless world, just as it is the spirit of unspiritual conditions. It is the opium of the people. Marx lived for a long time in London. He died there in 1883. After he died, his friend Engels finished many of his works. Marx is buried at Highgate Cemetery, London. Sorry, this article isn’t complete yet.